Ensuring constant response times and 100% uptime for complex, multi-tiered and geographically distributed applications is complicated. Dynatrace DC-RUM (Data Center Real User Monitoring) is a powerful solution for monitoring application performance in these distributed environments. Ensuring constant response times and 100% uptime for large, complex, multi-tiered collections of applications, middleware, databases and networks is complicated. It’s made more complicated because different organizational units are often responsible for different parts of the application infrastructure: network teams, database teams, web application developers and others often operate in independent silos, each team using different monitoring tools. When something does go wrong, this silo approach often leads to war room responses and teams shifting blame, making it difficult to ascertain what’s happened. A comprehensive and robust monitoring solution that works across silos, and is shared by all IT Organizational units, removes this war room approach. 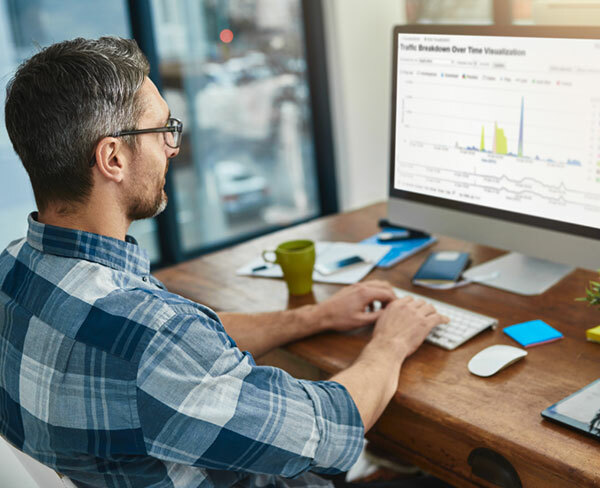 To enable truly accurate issue analysis and resolution, event history needs to leverage an accurate, packet-level record of traffic. Packets provide irrefutable evidence about where the problem lies and what’s causing it. Integrating Dynatrace DC-RUM with the Network History recorded by EndaceProbe™ Analytics Platform gives operations teams detailed, packet-level evidence for quickly and accurately diagnosing and troubleshooting application performance issues. Integration between Dynatrace’s DC RUM Central Analysis Server (CAS) and EndaceProbes gives analysts streamlined access to network history for fast, conclusive investigations. Clicking on an event in the CAS lets analysts quickly drill-down, retrieve and view specific packets relative to the interaction from the Network History stored on one or more EndaceProbes. Using the EndaceProbe’s built-in EndaceVision™ investigation tool, analysts can search and filter packet history and download packets for analysis in Dynatrace Network Analyzer™ (DNA) or Wireshark. Packets can also be analyzed directly on the EndaceProbe using EndacePackets™, removing the need to download large trace files across the network. Host virtual AMD (vAMD) in Application Dock on EndaceProbes for quick and easy deployment. The Fusion Connector that provides integration between Dynatrace Central Analysis Server (CAS) and EndaceProbes is built-in to the CAS. It requires a license to activate it which is available from Dynatrace. The vAMD for Application Dock is available from Dynatrace. For more information about configuring vAMD to run in Application Dock please login to the Support Portal. If you don't have a Support Portal account you can request one here. 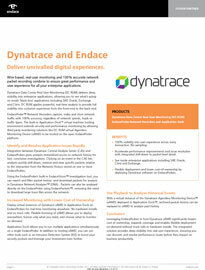 Interested in finding out how the Dynatrace DC RUM and Endace integration can benefit your network security and network monitoring?